Dr. Larry King, Stephen F. Austin State University professor in the Department of Languages, Cultures and Communication, has been re-elected by the Liberal Education and America's Promise Texas Board of Directors to serve a second term as chair of the organization. LEAP Texas is a collaborative of higher education institutions seeking to improve higher education for students and faculty members throughout Texas. 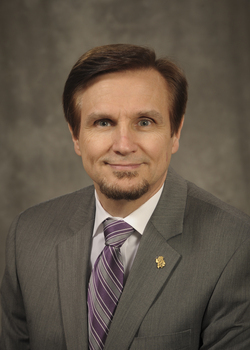 NACOGDOCHES, Texas - Dr. Larry King, Stephen F. Austin State University professor in the Department of Languages, Cultures and Communication, has been re-elected by the Liberal Education and America's Promise Texas Board of Directors to serve a second term as chair of the organization. According to its website, LEAP Texas is a collaborative of higher education institutions with common issues and a shared purpose. Its mission is to provide a structure through which Texas public and private higher education institutions can communicate, organize and develop plans and policies that address their common interests by improving higher education for students and faculty members throughout Texas. LEAP Texas provides opportunities for faculty, staff and administrators who want to improve their classes and institutions through various essential learning outcomes, high-impact practices, students' signature work and more. "We work to help students obtain high-quality educational experiences that prepare them for success in their personal and professional lives," King said. King believes LEAP Texas is important for higher education institutions because of the increasing diversity in student demographics. Additionally, he said the organization can assist and support institutions in promoting student success. "LEAP Texas wants to help students succeed," King said. "We partner with colleges and universities that desire to assist students in reaching their academic and career goals." Forty-nine Texas higher education institutions comprise LEAP Texas, and it also is an official partner of the Association of American Colleges and Universities LEAP States initiative. To learn more about LEAP Texas, contact King at lking@sfasu.edu, or call (936) 468-1260.